If the were hidden they wouldn't "partially" disappear. 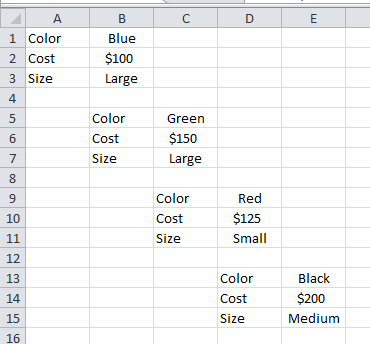 What would the formula be if I wanted to search a particular sheet for the word "Cost" and then sum all the values in the cell immediately adjacent that "Cost" cell? Unfortunately, SUMIF alone will not work for me, as my "criterion" is not in a single column. I'd need like four different formulas if I wanted to only sum those cells to the right of "Cost." But given the size of my spreadsheet, that's not going to work. Seems I need a formula which will search for "Cost" everywhere, and then sum only the cell to the right of that cell. Would you be able to play around with the formatting to make it more organized or is it too much data? This is a messy approach, but you can create a new tab, and create a forumla in each cell to reference your original tab that if A1 (etc) = cost, then give value of cell to the right of it. Then you'll have a tab full of the amounts only, and you can sum them all up. VBA is the way to go if you want anything to be done efficiently. You could make a sluggish array summing all cells to the right of a cell that matches "Cost" (if that's always the case). Depending on the size of the data, it might not be so sluggish. What would the array look like?